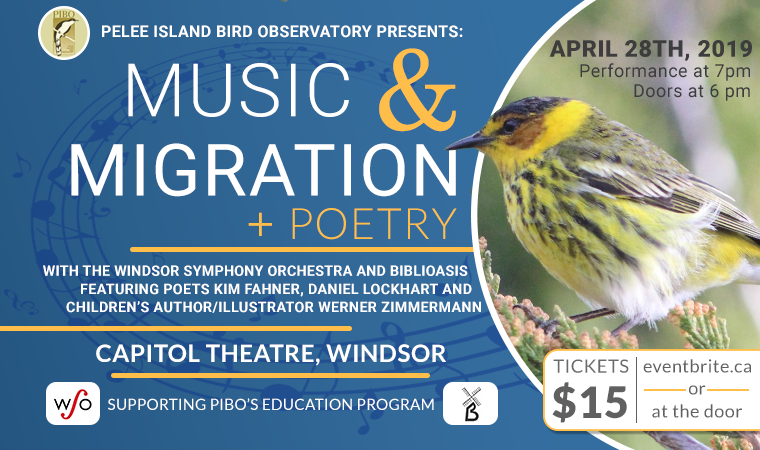 Music and Migration is a collaboration between Pelee Island Bird Observatory, The Windsor Symphony Orchestra and Biblioasis Books. This is our second year hosting the event, and we are adding an exciting literary component. The first hour will be led by Associate Conductor, Daniel Wiley and will feature music based on the themes of spring, nature and migration. For the second hour, we will give the stage to local authors and poets who will read short pieces from their works based on similar themes. There will be a brief intermission between acts. Funds raised from this event will go towards our free environmental education program that benefits elementary and secondary students in Windsor and Essex County.